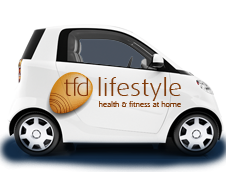 Welcome to tfd lifestyle offering PT, Physiotherapy & NLP Life Coaching in the Wantage, Abingdon & Faringdon areas. We bring the expected high standards of tfd to you in the comfort and convenience of your own home. Our fully qualified, experienced and DBS checked team of professionals bring the tfd service and values to you and fit around your lifestyle to make it even easier for you to stay fit, healthy and full of life. We like to keep things really simple and deliver what you ask for. We currently have three areas of expertise under the tfd lifestyle banner; Personal Training, Physiotherapy and NLP Life Coaching. We bring everything you’ll need. Just clear a bit of space, pour yourself a glass of water and wear something comfortable. Simply start with the free telephone consultation to help us assess the best professional to suit your needs and goals, then complete the health questionnaire and declaration and finish with the payment for your choice of sessions. You’ll receive email communication from the tfd lifestyle team to arrange and confirm your sessions and you can contact this team directly at any time should you have any questions or need to make changes.